The history of mat weaving in India dates back to the Indus Valley Civilisation and its socio-cultural relevance can be traced to the references found in our ancient literature. Records of the Medieval Period provide the first information of mat weaving in the region of Bengal - when both ordinary mats and the fine variety were produced. In Bengal, the word Madur is a generic for floor mats, though in actual fact it is the name given to mats woven from a specific kind of reed. Prior to the advent of concrete or brick, the walls of most village houses were made of clay, and the earthen floors were polished with a mixture of clay, cow dung and finely cut hay. Furniture as we know it, had not been introduced into rural Bengali homes and people sat or slept on the floor. Since these floors were cool in summer but cold and uncomfortable in winter, mats and pallets or straw mattresses made from grass, leaf, reed, etc. were used to keep out the cold. 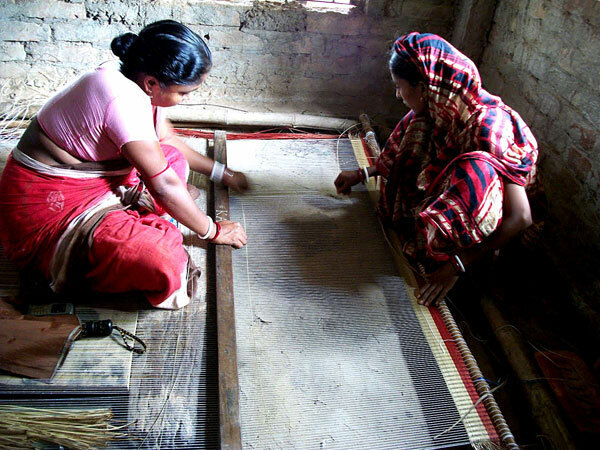 Mats have been an integral part of the social scene of rural Bengal. Most homes possessed a few which served both domestic and social purposes - from seating guests, bedding for older ladies and babies massage sessions to seating for afternoon gossip sessions. Mats also formed a part of the bride’s trousseau showcasing the artistic and creative skills of the women of the household who generally wove the mats. Besides beautiful borders and motifs, the mats were sometimes inscribed with loving messages like “A gift of love for my younger brother’s wedding.” Even today, large madurs are still used in many households in West Bengal. Prior to the advent of concrete or brick, the walls of most village houses were made of clay, and the earthen floors were polished with a mixture of clay, cow dung and finely cut hay. Furniture as we know it, had not been introduced into rural Bengali homes and people sat or slept on the floor. Since these floors were cool in summer but cold and uncomfortable in winter, mats and pallets or straw mattresses made from grass, leaf,reed, etc. were used to keep out the cold. With the move from floor seating to sofas and chairs, the uses of these mats shifted and widened to include various uses such as decorative and utilitarian items like table mats, toys, trays, furnishing material, wall hangings,lampshades etc. The craft is simple, marvelously flexible, accessible and adaptable and entirely organic. Mat weaving is one of the important crafts of West Bengal providing seasonal employment to thousands of artisans, spread over several districts of the state. 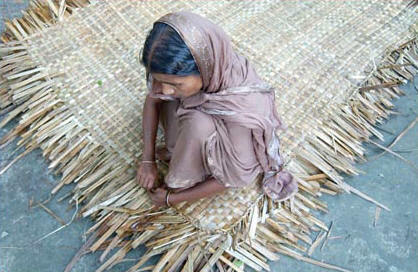 Of the several varieties of mats woven, the Madur, a type of reed mat, woven mainly in Medinipur, is the most popular. Another kind of mat called Shitalpati, woven from a different reed, is produced mainly by the artisans of Cooch Behar and North and South Dinajpur districts, while in the dry, lateritic areas of Birbhum, Bankura and Purulia, there are also mats woven from date palm leaves. 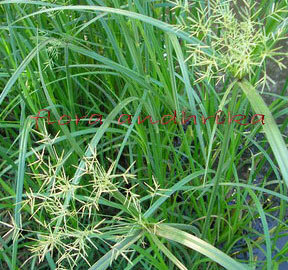 The madur kathi grass that goes into the making of madur is a thin soft reed (Cyperustegetum or Cyperus pangorei) which is found abundantly in the alluvial tracts of East and West Medinipur districts. There are three different varieties of Madur produced in West Bengal of which Masland, the ultra fine variety, is concentrated in the south eastern part of Medinipur. The other two varieties are the Ekhrokha and Dorokha. Weaving of madur is a rural household industry with active participation by family members – predominantly women artisans assisted by children.Both farming of madur grass and madur weaving is an additional source of income for farmers. The simple tools are locally fabricated or even inherited and the highly labour intensive technology has been passed down through the generations. The looms take up little space and are placed inside their own homes. Traditionally, mat weavers of Medinipur were Baitis by caste but soon the Mahishyas, who were usually cultivators, and not a traditional craft community, dominated the industry. The process of madur production involves a number of labour intensive activities. First there is the pre-loom weaving which is the preparation of the basic raw-material. This includes the cultivation of the madur kathi grass from which the mat will subsequently be woven, followed by the sizing and dyeing of the reeds,as required. Saplings are planted during the Bengali month of Boishakh (April-May). When the grass is fully grown to about 4 or 5 feet, the stalks above ground are cut, leaving the tubers below ground (called mudaa or modaa ) to sprout anew. Grass cutting takes place between September and December. The stalks are dried, cleaned and each stalk split into 4 to 8 strips. The soft inner tissue is removed and discarded. Before weaving, the reeds are soaked in water to soften them. The most important and time consuming part is the loom-weaving phase when the soft reeds and cotton or jute thread are arranged on a simple bamboo frame loom as weft and warp respectively. The final post-loom weaving phase consists of cutting the edges or binding the edges with coloured cloth and polishing. There are also the chala or dopati madurs made by attaching two mats with a ribbon of cloth that renders the mat foldable. The varieties appear as a response to the demand from the consumers. Mats are normally four feet wide and six feet long and the life span of a madur is about a year. 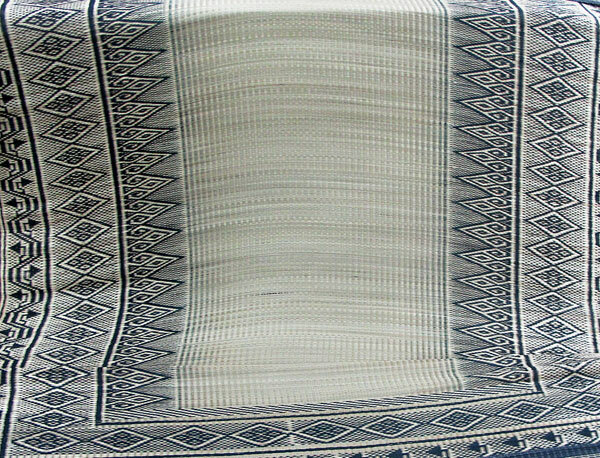 The Ekrokha madur is woven using a single reed, madur kathi weft and requires the least amount of skill. The Dorokha which employs a double reed weft, requires good skill. It is thicker and more comfortable to sit on than the simple Ekrokha madur. The weaving of the exquisite Masland madur on the other hand is an artistic pursuit that demands precision and a high level of skill. According to a report of 1994, the production of Ekrokha mats is the largest at 55%, followed by Dorokha at 30%, while the intricate Masland mat weaving constitutes only 15% of the industry.  The word Masland is derived from the Persian word Masnad or throne. The Masland mat is a very fine textured mat with a smooth silken feel, woven to perfection by the artisans of Medinipur. The origin of the masland mat in West Bengal dates back to the Muslim period, when mats of ultra fine variety with silk yarn as weft were produced under royal patronage in Medinipur. Maslandpur, a village near Mahishadal in Tamluk subdivision, which probably got its name from the madur itself, was noted for its fine mats, some of which were being sold at more than a hundred rupees per mat at the beginning of the 20th century, according to records from the British Raj of the time. The best mats of the time were made at Raghunathbari followed by Kasijora and Narajol. Masland is made of carefully selected madur kathi reeds woven in beautiful geometric designs that use the natural two-tonal colouring of the reed to create subtle patterns in the mats. The masland madurs were originally made using vegetable dyes, the predominant colours being maroon and black. Now both vegetable and chemical dyes are used. The maroon or black vegetable dyes are used as a border with the natural reed mat. The black dye is produced by grinding the Haritaki fruit with the bark and fruits of the prickly Babla tree. A local shrub called rang gachch (meaning colour plant) is the source for the natural reddish dyes. While dyeing, the reed bundles are first tightly bound at places, where the natural colour is to be retained, with palm leaves. The bundles are then placed in a pot filled with a mixture of dye powder and cold water. Then it is boiled for 10 hours in case of reddish dyes and 24 hours in case of black dyes. Next,they are sun dried and made ready for weaving. Masland requires two persons for the weaving. One person places the specially selected reeds and starts the process from left to right by placing one thread on top and dropping one thread down while the second person performs the same from right to left. The threads are then turned at the end and the process continued. The shuttle carries two threads. Masland mats are particularly famous for the intricate naksha or motifs executed on them. The weaving is similar to the weaving of saris. Popular are scenes from mythology and designs like barfi (rhomboidal), jharna (waterfall), mouchak (honeycomb), different flowers and vines. However with stiff competition from synthetic materials, the makers face the prospect of shutting down. The areas in Medinipur where the craft is practised include the Sabong, Moyna, Egra, Panshkura (Raghunathbari) and Ramnagar blocks. Madurs are also woven in Howrah district. Some of the artisans making Masland mats have been awarded at the national level. To name a few: Khagendranath Pradhan and his wife Vishnupriya and Sarojubala Giri of Kholaberia (Ramnagar Police Station). There is also a large variety of interesting mats made by basket makers, rural Muslims and tribals all over Bengal both for their own use as well as for the rural community in general. In Birbhum district Muslim women of Ilambazar use the fan shaped leaves of the date palm tree to make large Chatai mats for sleeping. The leaves are cut into flat narrow strips which are joined and woven, as both warp and weft, with mathematical precision into beautiful geometric designs.The strips are sometimes dyed in blue, green or magenta and incorporated with the natural coloured strips. Date-palm leaves being very short, the mats are woven in strips and then joined together. 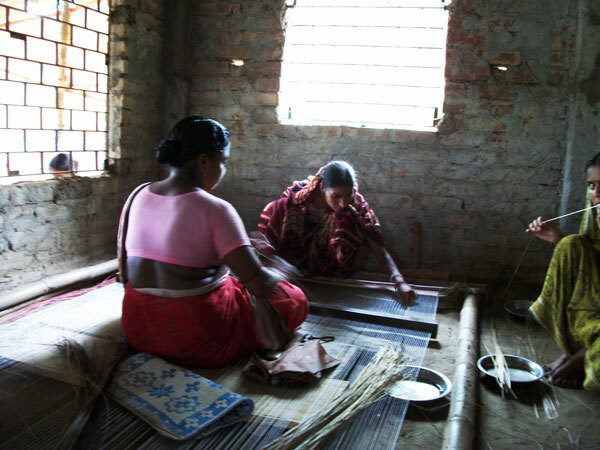 These mats are widely made and used by the rural poor in the districts of Purulia, Bankura and Birbhum. Patterns and motifs vary from district to district. Soft and spongy mats are also made from Hogla grass (Typha angustata or Typha elephantina Roxb) - elephant-grass that grows on wetlands and riverbanks. It is found in the mangroves and tidal forests of the coastal belts adjoining the Sundarbans. It is believed that the names of the district of Hooghly and its river are derived from the abundance of this plant. Hogla is a hardy and durable material making it perfect for floor mats which can be used outdoors as well as indoors. The plant grows between 6 to 16 feet (2 to 5 m) tall. Leaves grow from near the base of the plant and are long, thick and triangular. It flowers in summer and autumn. The hogla leaves are dried in the sun and a bundle of dry hogla leaves make up to five floor covers, each measuring six feet by seven and a half feet. These mats are finished by adding a binding on all four sides of the mat. These mats are also used to dry crop on, for making storage containers, as hut walls and as prayer mats. Women and children in different villages are engaged in making these floor covers.